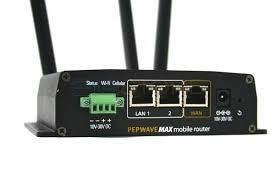 The Pepwave MAX BR1 is a super mobile networking device. It can prioritize the WAN connection input from ethernet to wifi to cell fall-back. It has 2 sim slots to maintain internet service. The LAN side is also fully managed including WiFi. This device is in use to support the i-Gates, hotspot and the DMR repeaters when use mobile.